Want a fun green drink for kids this holiday season? 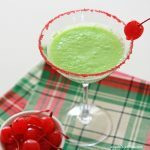 Make them surprisingly tasty creamy apple mock-tini recipe with a red rim and cherry on top. Drizzle honey into the outside rim of a saucer. Arrange sprinkles in the outside rim of a second saucer. Flip your cup upside-down onto the saucer with the honey and and spin to ensure that the rim is evenly coated with a thin layer of honey. Dip the honey-coated rim in the sprinkles or sparkling sugar and spin to ensure an even coat. Combine Jones' Green Apple Soda and eggnog. Stir well. Pour soda combination into prepared glass and garnish with a maraschino cherry. *Feel free to substitute softened vanilla ice cream for a milder, but just as tasty version!